Get a great shirt with a great message, and help support the efforts of Norml Canada to bring about cannabis law reform in Canada. $28 each. Shipping and handling included. Anywhere in Canada! Share the knowledge! 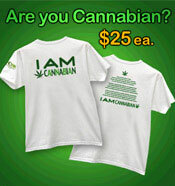 Add a CannabisFacts.ca banner to your web page. Fact #1: In 2002 the Senate Special Committee on Illegal Drug Use studied the cannabis issue extensively. Their unanimous recommendation was that cannabis be legalized in a regulatory framework similar to alcohol. Read more quotes from the Senate Committee's report. Regulatory system allowing the culture, production, marketing, sale and use of substances. Although none currently exist in relation to "street-drugs" (as opposed to alcohol or tobacco which are regulated products), a legalisation system could take two forms: without any state control (free markets) and with state controls (regulatory regime). Source: The "Glossary of key terms" in the Senate Report. Fact #2: The decision to criminalize cannabis was made "without any apparent scientific basis nor even any real sense of social urgency." Fact #3: "Scientific evidence overwhelmingly indicates that cannabis is substantially less harmful than alcohol and should be treated not as a criminal issue but as a social and public health issue." - Senator Pierre Claude Nolin, Chair of the Senate Special Committee on Illegal Drugs, during the press conference for the release of the committee's report. Dr. Jack E. Henningfield of the National Institute on Drug Abuse and Dr. Neal L. Benowitz of the University of California at San Francisco ranked six commonly abused drugs by five criteria. 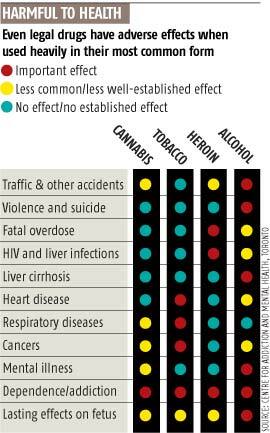 This comparison shows current laws are not based on the potential harm caused by various substances. If that were the case then alcohol and cigarettes would be illegal. The current laws against marijuana are without scientific basis. Withdrawal: Presence and severity of characteristic withdrawal symptoms. Reinforcement: A measure of the substance's ability, in human and animal tests, to get users to take it again and again, and in preference to other substances. Tolerance: How much of the substance is needed to satisfy increasing cravings for it, and the level of stable need that is eventually reached. Dependence: How difficult it is for the user to quit, the relapse rate, the percentage of people who eventually become dependent, the rating users give their own need for the substance and the degree to which the substance will be used in the face of evidence that it causes harm. Intoxication: Though not usually counted as a measure of addiction in itself, the level of intoxication is associated with addiction and increases the personal and social damage a substance may do. Fact #4: "The continued prohibition of cannabis jeopardizes the health and well-being of Canadians much more than does the substance itself." "We estimate the cost of enforcing cannabis drug laws to be closer to $1-1.5 billion per annum. The principal public policy cost relative to cannabis is law enforcement and the justice system; we estimate this to represent a total of $300-$500 million per annum. The costs of externalities attributable to cannabis are probably minimal; no deaths, few hospitalizations, and very little loss of productivity." Cannabis prohibition diverts much needed police resources from more serious issues. In an unregulated black market there are no age restrictions, quality control, or accurate product information. High profits attract organized crime and with that comes increased violence as a means to resolve disputes or protect investments. Fact #5: Cannabis has NOT been decriminalized or legalized in Canada. Canada's Le Dain Commission recommended the decriminalization of cannabis back in 1972! Over 30 years later and we're still only talking about it. It is illegal in Canada to possess, produce or traffic in cannabis. b. Where one of two or more persons, with the knowledge and consent of the rest has anything in heir custody or possession, it shall be deemed to be in custody and possession of each and all of them. c. to offer to do anything mentioned in a) or b) above, otherwise than under the authority of the regulations. A person also commits an offence of trafficking in a substance included in Schedule I, II, III, or IV or in any substance represented or held out to be by that person a substance. "Possession of the Purpose" means that the person must be in "possession" as set out in the definition above and for the purpose of "trafficking" as set out in the definition above. "The Senate Special Committee on Illegal Drugs final report says marijuana is less harmful than alcohol and should be governed by the same sort of rules." "The continued prohibition of cannabis jeopardizes the health and well-being of Canadians much more than does the substance itself." Topic: Terry Parker appealed to the Canadian Charter of Rights and Freedoms for the right to smoke cannabis legally for medicinal reasons. "The Ontario Court of Appeal warns the federal government to change its pot laws within a year or risk losing them altogether." "In June 1970 the Commission of Inquiry into the Non-Medical Use of Drugs delivers its interim report, calling for the decriminalization of all drugs." Handout: How many more studies are needed? (PDF, 36k) Description:List of cannabis studies 1894-2002. Fact #6: The so-called "decriminalization" bill proposed by the Liberal government was actually an "alternative penalties" bill. The core flaw of this bill is that it was crafted without acknowledging the dynamics of the black market and the considerable harms being caused by the policy of prohibition. This bill would actually make matters worse with its contradictory and confused approach. Under this bill, possession of small amounts of cannabis would remain illegal, but a fine would be rendered instead of a criminal charges being laid. In addition, this bill proposes to double the maximum penalties for growing cannabis. Removal of a behaviour or activity from the scope of the criminal justice system. A distinction is usually made between de jure decriminalization, which entails an amendment to criminal legislation, and de facto decriminalization, which involves an administrative decision not to prosecute acts that nonetheless remain against the law. Decriminalization concerns only criminal legislation, and does not mean that the legal system has no further jurisdiction of any kind in this regard: other, non-criminal, laws may regulate the behaviour or activity that has been decriminalized (civil or regulatory offences, etc.). "We're not decriminalizing marijuana, to be technical, it will remain a criminal offense. What we are putting in place are alternative penalties, in using the Contraventions Act. I admit that using "decrim" at the beginning was not a good start, but over the past few months we have been quite clear about what we're doing." - Martin Cauchon - former Justice Minister, during questioning by the House of Commons Committee on Illegal Drugs regarding the proposed "decriminalization" bill. November 2003. Mr. Cotler avoided any mention of decriminalization -- instead calling his cannabis enforcement reform "alternate penalty frameworks." Obviously the government has not been "quite clear" about what they're doing. The term "decriminalization" continues to be used by politicians and by the media regardless of the facts. The correct description of this bill is an "alternative penalties" bill and the media needs to be urged to be more accurate about the details of this bill and not simply pass along misinformation. As noted in Alan Young's article "Marijuana mountain built out of molehill" in the Toronto Star, "The best way to forestall change in a democracy is to confuse the masses." The	"decriminalization" bill does NOT represent a more relaxed attitude toward cannabis users. The intended outcome of using a ticketing approach is to INCREASE the likelihood that someone caught in possession of a small amount of cannabis will be punished. "A ticket would be more immediate and a police officer would be MORE LIKELY TO WRITE A TICKET. Right now the laws are not evenly enforced, often police will turn a blind eye, which teaches disrespect for the law. We want fines to be rendered." "There is an uneven application of the law. In many places the police warn an individual and don't charge. We think, actually, with what we're proposing a person with a small amount will be more likely to suffer a consequence for breaking the law. So we actually think we're being a little tougher on people by suggesting that there would be a fine for the breaking of the law and police officers would be more likely to write that ticket rather than it walk away." - Paddy Torsney - member of the House of Commons Special Committee on the Non-medical use of Drugs. [Martin Cauchon told] reporters that the legislation was needed because current pot laws, under which possession is a criminal offence, are "disproportionate." "Does it make sense that a person who makes a bad choice should receive the lasting burden of a criminal conviction? This bill will ensure that the punishment fits the crime." - Martin Cauchon - former Justice Minister of Canada. A ticketing approach has already been implemented in Australia. The result was a "net widening" effect; more people being punished due to the "efficiency" of ticketing a person versus arresting. Tickets mean MORE punishment, not less. Fact #7: Reforming cannabis laws does NOT send the "wrong message." "We want to send a message that marijuana is illegal and it is harmful to society"
- Martin Cauchon - former Justice Minister of Canada, during a press conference for the tabling the "Cannabis Reform Bill"
"We submit that Canada must resist the deceptive messages and seductive temptations being advanced by a sophisticated drug lobby." David Griffin of the Canadian Police Association says the legislation sends the wrong message. 'I'm more concerned that we're sending a message to young people: Don't drink and drive, toke and drive.'" "This legislation is seriously flawed and sends the wrong message to Canada's youth." Commentary: The government and police organizations dismiss the possibility of legalizing cannabis based on the assumption that doing so would increase use by sending a message that cannabis use is acceptable. 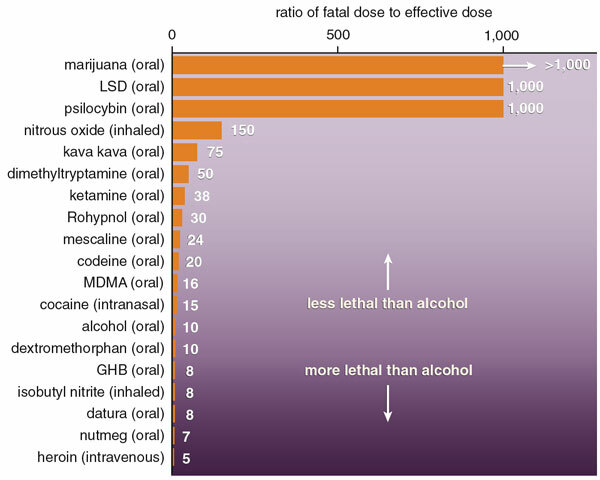 The policy of cannabis prohibition has been shown to have no impact on rates of use. The vast majority of people who are interested in trying cannabis have already done so. Our government's current cannabis policies are neither effective nor evidence-based. In a modern liberal democracy, policies should be based on common sense and compassion, not fear, prejudice and misinformation. The real question is, "What message is our current policy toward cannabis sending to Canada's youth?" Fact #8: The U.S. government is pressuring Canada to back away from cannabis law reform. U. S. government officials have issued strong warnings that if Canada goes ahead with "decriminalization" the result will be border slowdowns due to the need for increased scrutiny at the border, even though... Fourteen U.S. states have already enacted some form of decriminalization, some of these states going even further than what the Liberal government was proposing. "Denver residents Tuesday voted to legalize possession of up to one ounce of marijuana, but the state attorney general said the vote was irrelevant because state law will still be enforced." Currently there is a similar initiative underway in Nevada. 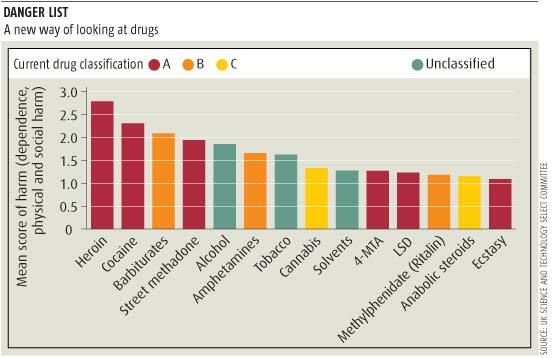 A chart from the SAFER web site. Fact #9: The U.S. Drug Enforcement Agency has had offices in Ottawa and Vancouver since 2001. The marijuana industry was specified as one of the key reasons for the Vancouver office. The RCMP have been working closely with the DEA for many years. Vancouver and Toronto are the only cities in Canada with U.S. law enforcement hubs, although one is in the works for Montreal. Senior U.S. agents in Ottawa oversee the work of the hubs. But the total number of U.S. agents in Canada remains classified. The RCMP, by way of comparison, says it has four RCMP liaison officers based in the whole of the U.S. Two are in Washington, D.C. and two in Miami, Fla. Fact #10: Canada is NOT a major source of cannabis to the United States. "Frankly, I'm worried about Canada beginning to look like Mexico as a major supplier of drugs into the United States." 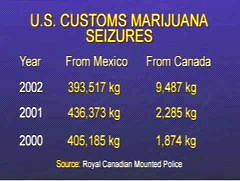 FACT: "Canadian-produced marijuana accounts for only approximately 2% of overall U.S. marijuana seizures at its borders." FACT: Mexico supplies about 46% of the U.S. demand for cannabis. FACT: "Most of the marihuana available on the American illicit market still originates primarily in the U.S. and in Mexico. Canada ranks far below Mexico as a source for the U.S." - RCMP report:, "The Drug Situation In Canada - 2003"
Source: RCMP report:, "The Drug Situation In Canada - 2003"
"Evidence Challenging Us Claims About Canadian Cannabis Exports "
The majority of Canadians disagree with the current approach to cannabis and yet the government continues to ignore the significant support from Canadians for genuine cannabis law reform. Cannabis prohibition is expensive, ineffective, and causing significant harms to Canadian society. For the good of ALL Canadians, it's time to end cannabis prohibition. 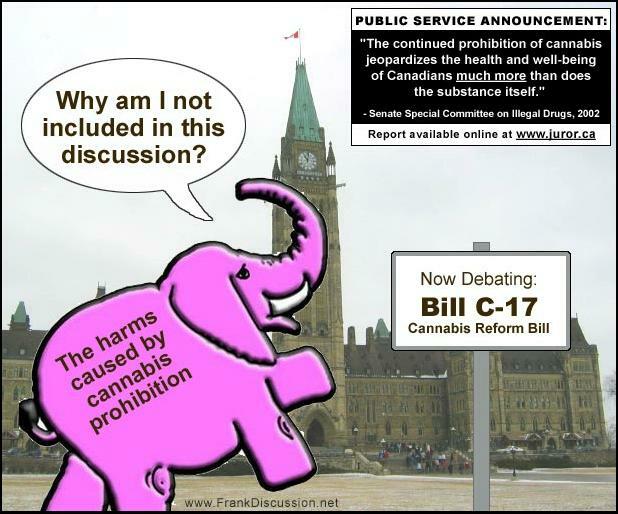 Help educate the Canadian public about the cannabis issue and raise the quality of the debate. Add a Cannabis Facts for Canadians banner to YOUR web site!